Currently, I am offering my eBook on How to Make & Customize Your Own Hot Process Soap for affiliates to share with their followers and readers. It sells for $9.99, and I'm offering a 50% commission! 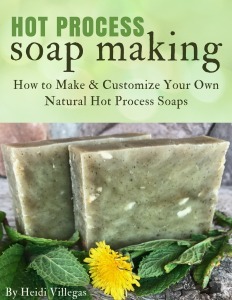 The "Hot Process Soap Making: How to Create & Customize Your Own Natural Soaps" eBook focuses on how to make hot process soap, because I have found there just are not a lot of resources available about making soap in this traditional way. I teach people how to make their own healthy vegan soap in this book, as well as how to customize it to meet their own personal needs and wants using herbs, clays, and essential oils for color, texture and scent. Many soap making books are just plain overwhelming for beginners! There are lots of recipes that look amazing, and often many different kinds of ingredients are necessary between the recipes. That means if you want to make two different kinds of soap, you may have to buy oils that just might end up sitting around for years. My book keeps it simple. There is one base recipe that has never once failed to be a winner. The oils are quality oils, and the combination is great for the skin! Then I provide recipe options to make variations as well as lists of clays, herbs, and essential oils to give readers even more ideas for personal customization. This is a great book for the soap maker who wants to try the hot process method, who doesn't want to wait six weeks to use their handmade soap, or the complete beginner who wants a very complete picture tutorial and guide. I hope you'll consider becoming an affiliate! Click here for the sign up link! Please email me if you are interested but have questions about anything! Edited NOTE: I now offer three other eBooks you can share with your readers and friends: Natural Cold & Flu Care: A Complete Guide; Herbal Salves, Oils, Butters, & Salves; and How to Create Your Own Herbal Tea Blends for Pleasure & Health. This is a 300x250 image, so it will fit nicely in your sidebar and also within text without overwhelming people. Become an Affiliate! Click Here! You can visit my Sales Page or my Amazon Kindle page to see testimonials, if you like.